Here's a project the whole family can get involved in Thanksgiving day, "A Turkey Quilt." 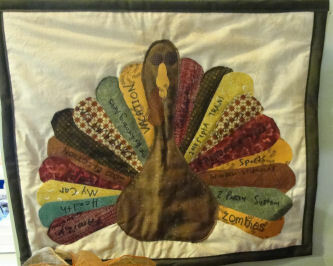 You make this mini turkey quilt and as each member of the family arrives, they write what they are thankful for. Year after year you can display the quilt and look back on times past and your family member's changing interests. This is the one I made last year. The family LOVED the idea and the involvement they had in it! This project is perfect for the whole family to get involved in. You cut and heat bond the turkey with little sewing. Then each family member writes on a feather what they are thankful for. Last the quilt gets put together and displayed year after year. I used a similiar idea years ago for their birthdays when my daughters were small. Everyone signed a white tablecloth and then traced their handprints on it. I then embroidered all the signatures, using a different color each year. Nice momento of them growing up. What a great idea, back to the scrap basket for me.